Conform to Rebel is Duwane Taylor’s first mixed-bill performance at Redbridge Drama Centre, commissioned by Artists 4 Artists, the increasingly valuable collective of Lee Griffiths, Joseph Toonga and Emily Crouch that works as a vehicle for change in the hip hop dance community; it’s achieving a lot more than 99 per cent of other dance development/venues who are paid to do a similar job. As a performer Taylor has a fine hip hop pedigree as one the UK’s leading exponents of krump. As well as creating work for his own krump crew, Buckness Personified, he has performed with ZooNation, Boy Blue Entertainment and a suite of others. As a choreographer he has made a number of shorter works including the seven-minute Candle in the Dark presented at British Dance Edition in 2014, Speak presented as part of Resolution 2018 at The Place and he was one of four choreographers to work with LIFT 2018 and East London Dance’s East Wall under the overall direction of Hofesh Shechter. Advertised as a mixed bill, the evening consisted of three works but with a first half of two works with a total duration of less than 20 minutes Conform to Rebel offers more of a choreographic tasting of Taylor’s range rather than fully developed works. With Taylor presenting the mixed bill under his own name rather than that of his crew, he follows a trend of some artists like Tony Adigun (Avant Garde Dance) and Kate Prince (ZooNation) stepping out of their company to profile themselves first and their company second. Project producer Emily Labhart offered an overview of Taylor’s choreographic offerings as an introduction. The first work, Anchored to The Beat, (6 minutes) had been made with three emerging dance artists and one member of Buckness Personified in little over a day. It is unfair to offer any critical judgment on their performance or on a work that has had so little time in the studio; while it is noble to offer a platform to the emerging artists, putting them in front of an audience with so little rehearsal time feels a little exposing. Letter to My… is a 10-minute solo that ‘explores the concept of absent fathers, which is often perceived as a recurrent reality within black communities’ with a score remixed by Jean-Pierre Nyamangunda and Taylor featuring Jay-Z and Will Smith’s spoken word. Taylor emerges with his face masked under an oversized rubbery hoodie which absorbs his arms and offers an interesting possibility of masking and swallowing his movement so that it becomes undefined and abstracted. Sitting facing an empty seat, Taylor plays the dual role of absent father and present son with a range of unsubtle reactions; he bursts out of his seat and hoodie to demonstrate the intensity of feeling while lip-syncing to some of the lyrics. It is well executed and technically proficient, but offers little choreographic, emotional or performative development from some of Taylor’s earlier works. Seeing Conform To Rebel a week after Ffion Cambell-Davies’ evolving 20-minute solo Womb Paves Way offers an alternative perspective on how krump can be used in a hip hop dance theatre context. Womb Paves Way looks at gender violence and colonialism whilst using a number of theatrical techniques and styles of dance, including a short use of krump. Although it feels like the work is still evolving and not yet settled, Campbell-Davies uses that brief window of krump in such an intelligent, restrained and nuanced way that demonstrates an exceptional choreographic awareness and ability to shift the emotional plane of her audience. 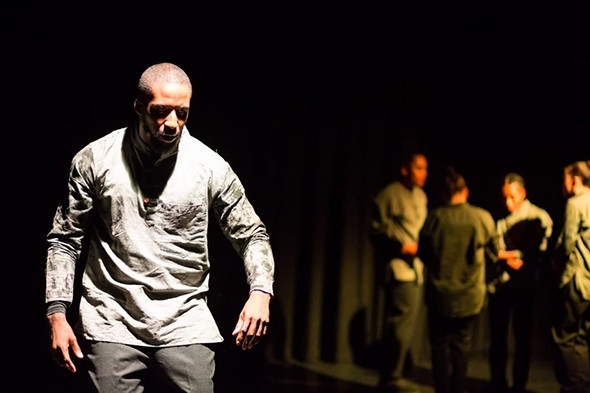 With a voodoo and ritualistic frame, the third work, Conform To Rebel, Rebel To Conform, gives Taylor and Buckness Personified the space and time (twenty-five minutes) to demonstrate their krump technique alongside a wider hip hop dance theatre vocabulary. Claire Hough skulks with menace and krump erupts from her limbs and face with a controlled power and threat which is mesmerising to watch. Her eyes and facial delivery have an almost abinhaya-like quality amplifying what her body is conveying as she corrals the other dancers into conformity with her choreographic line. There is a consistent debate and schism within hip hop between those who wish to preserve the foundation and codified movement vocabulary and those who wish to experiment, evolve and re-present those original forms in a choreographic and theatrical setting. Taylor clearly wants to evolve, and there are riveting moments when he brings Viviana Rocha on to his shoulder in an expression of double-decker krump and mixes the jab into a wider choreography. There is also a series of floor-based sequences with the performers on their backs; seeing krump on different planes, where the movement comes from within the body and projects into space is something I’ve not seen before. There’s a definite Shechter influence in some of the travelling sequences and if the work is on a conformity-to-rebellion scale, it would sit in the light rebellion spectrum. However, there is something interesting in Taylor’s choreographic voice; Conform To Rebel, Rebel To Conform demonstrates that Taylor can create and integrate the use of krump and other hip hop dance forms into a powerful and resonant work.